Chinese Authorities Arrest A Dozen People Over Explosions In Tianjin : The Two-Way The explosion killed at least 139 people. The people detained worked for the company where the explosions happened and center around potential corruption. A man stands near the charred remains of new cars at a parking lot near the site of an explosion at a warehouse in northeastern China's Tianjin municipality. 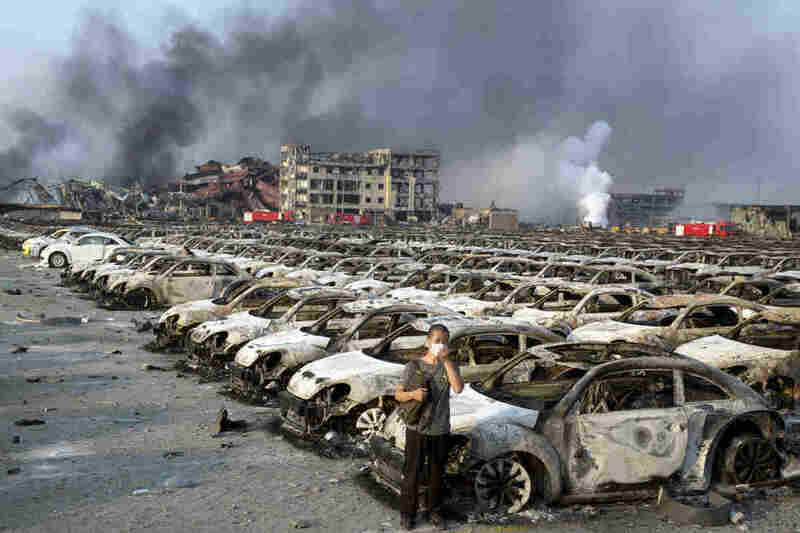 Chinese authorities detained a dozen people on Thursday in connection with an explosion in the Chinese port city of Tianjin that left at least 139 people dead. "Those detained include top officials with Ruihai Logistics, the company where the explosions occurred. According to the New China News Service, the investigation focuses on how Ruihui was able to gain approval to handle dangerous chemicals so close to residential communities. "Chinese law requires a 1,000 meter setback. Ruihai was well inside that, which is one reason so many people died and were injured. "Authorities are also investigating whether government officials colluded with the company. They include the head of the city transportation commission and the president of the company that runs the port. "An investigation has already found a senior Ministry of Transport official illegally helped the company obtain approvals for handling hazardous materials." Aside from detaining company officials, Chinese authorities also put 11 government and port officials under investigation. "In making the announcement, prosecutors described Tianjin officials as 'severely irresponsible' for failing to catch a number of violations committed by the owners of the warehouse, Rui Hai International Logistics. They noted that Tianjin officials, for instance, awarded a permit to Rui Hai, despite its 'illegal operation,' according to Xinhua." As Reuters reports, yesterday the the ruling Communist Party also "sacked the head of the work safety regulator, a former vice mayor of Tianjin, for suspected corruption, but without making an explicit link to the Aug. 12 chemical blasts."